In the United States, the three oldest stock exchanges are the New York Stock Exchange, the Boston Stock Exchange, and the Philadelphia Stock Exchange. With three major options, it can be difficult for traders to monitor all of their stocks, and spot new ones with the potential for massive profit. Day trading used to be reserved only for financial firms and professional speculators, but today, almost anybody can do it. However, in order to be able to make the right decisions with real-time information, traders will need to invest in the best trading computers. The fact that day trading is so popular might stem from the fact that, on December 31, 1999, the Dow Jones closed at 11497.12, its highest industrial average of all time. Though the market might not consistently be that good, there is still plenty of potential for big earnings. Nowadays, traders have the flexibility to focus on long term investments or super short trades that could be completed in just a matter of minutes. But whatever the case may be, having the right computer is a must. For casual traders, a simple laptop might be sufficient. Lots of people like to trade occasionally as a challenging hobby or just to try to supplement their income, so they won’t need massive computers. 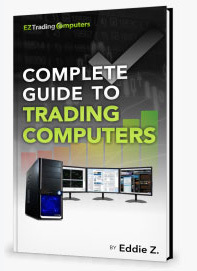 Trading laptops are perfect because they allow people to check their stocks and make maneuvers from just about anywhere that they are able to access an internet connection. This can be highly advantageous for anyone who doesn’t have a home office or work in the industry, but wants the flexibility to make trades often. But when it comes down to it, laptop trading computers rarely have the power to support serious traders. If someone has a career that depends on trading, they might want to make sure to find the most powerful computers on the market. PCs like the our Radical Extreme which boasts 32 GB of memory and a 4.5GHz multi-core, multi-tread processor have the power to collect all kinds of data in real time. And when they are combined with multiple monitors, they form the best trading computers available. Not being able to quickly access the most up-to-date information could be quite costly, so serious traders will have to make sure to find a computer that gives them the power they need.